Out on the southern ledges. "All around the cathedral, the saints and apostles, look down where she sells her wares": Feed the Birds from Mary Poppins. Here's one such 'saint and apostle', John the Baptist. 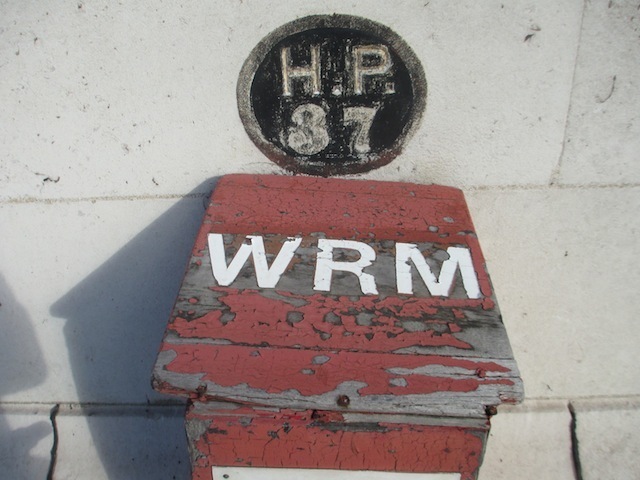 The roof still retains fire wardens' posts from the Second World War. 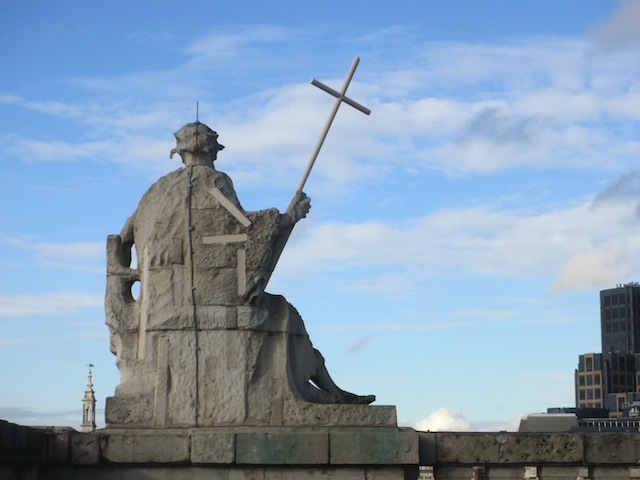 The brave souls who manned these stations saved the cathedral from probable destruction. 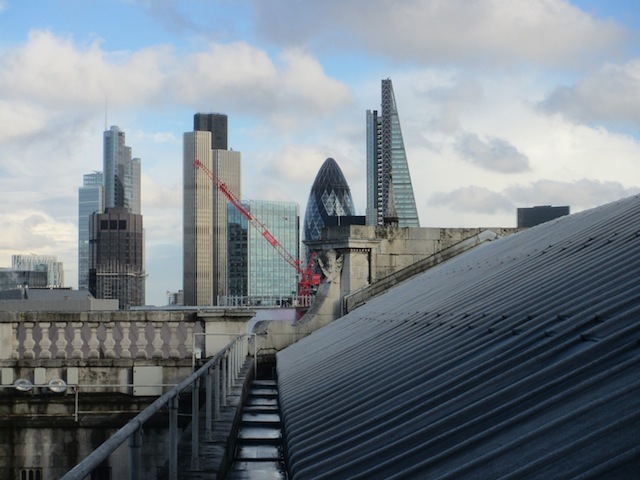 Looking east towards the City of London. The tallest building, the 'Cheesegrater' is angled that way to protect views of the cathedral. 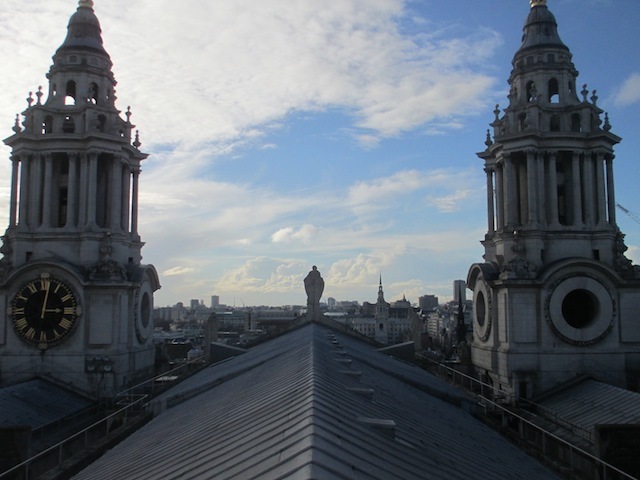 A view from a northern section of roof towards the City. 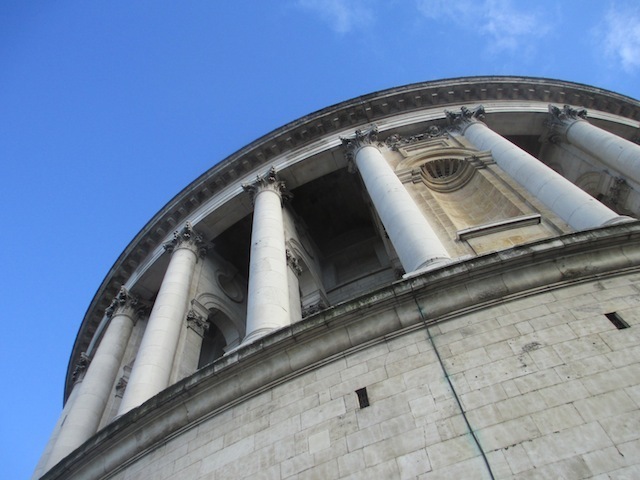 Looking up towards the tower. High classical flourishes that few ever get to see. We're not sure what these hidden cavity spaces are called, but they're big, and offer unique views of the dome. Interesting, also, to note the flying buttresses, which were deemed 'too gothic' to be publicly visible. 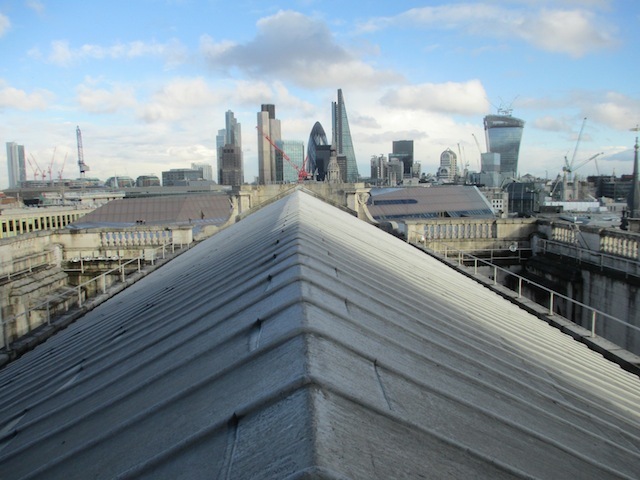 Looking west from the apex of the roof. 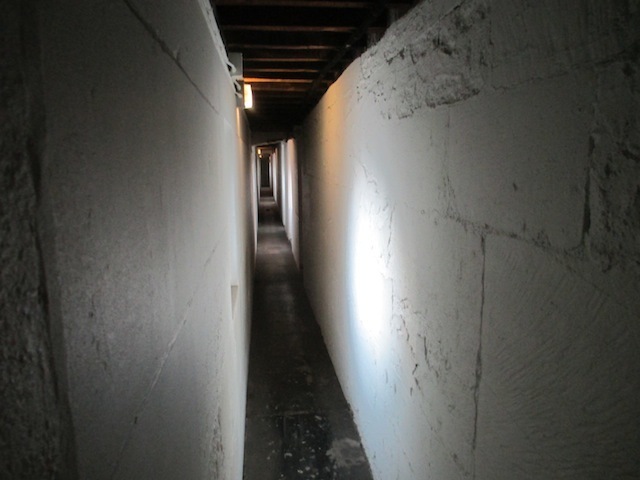 The interior of the cathedral is a maze of narrow passages and rooms. 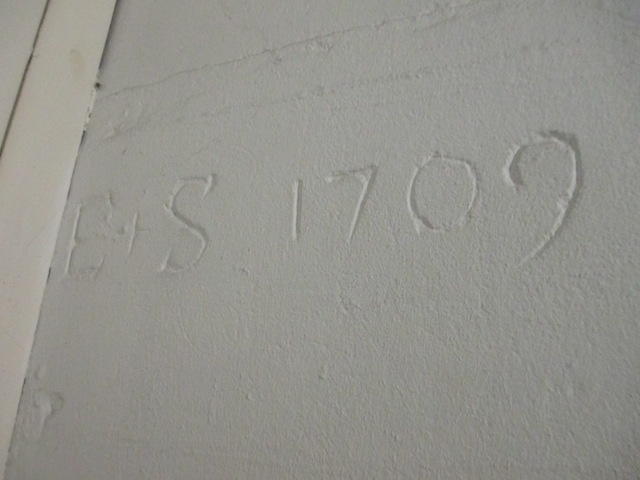 Ye olde graffiti, presumably by one of the original stone masons. At least two rooms contain remains from the Medieval cathedral, destroyed in 1666. 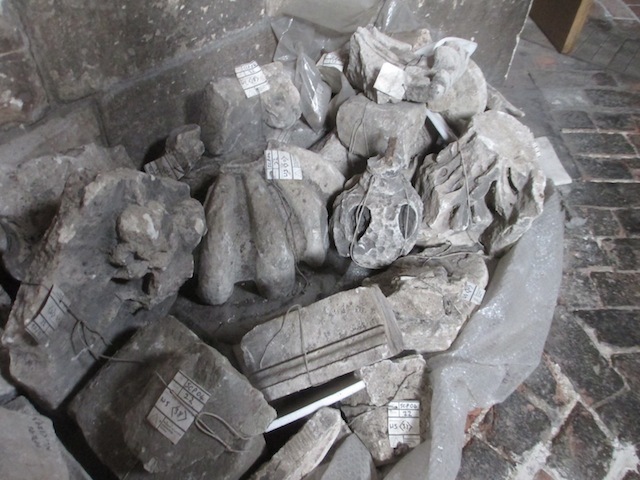 Here we see fragments from Inigo Jones's classical reworking of the west front, from the 1630s. 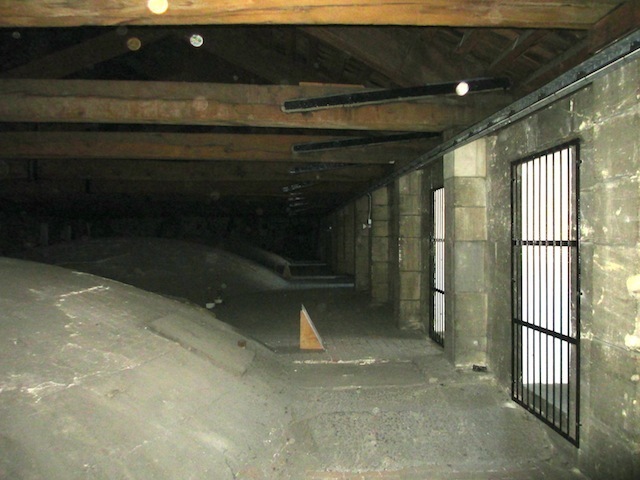 The roof space above the cathedral's Quire. 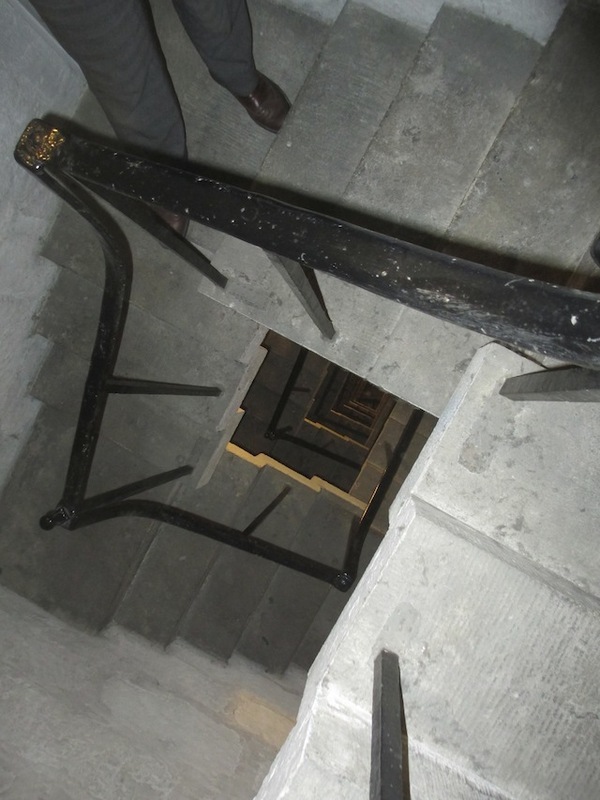 The floor here is only a few inches thick, and we were mindful of the long drop beneath. The roof space contains numerous peep holes. 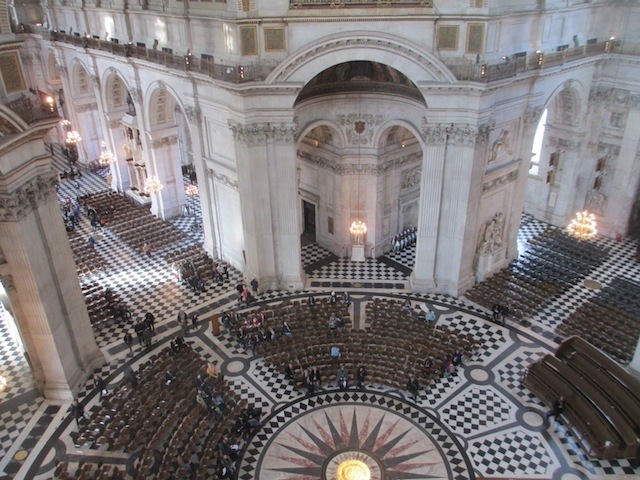 Difficult to photograph, the action of looking down to the quire floor from so high up was slightly unnerving. 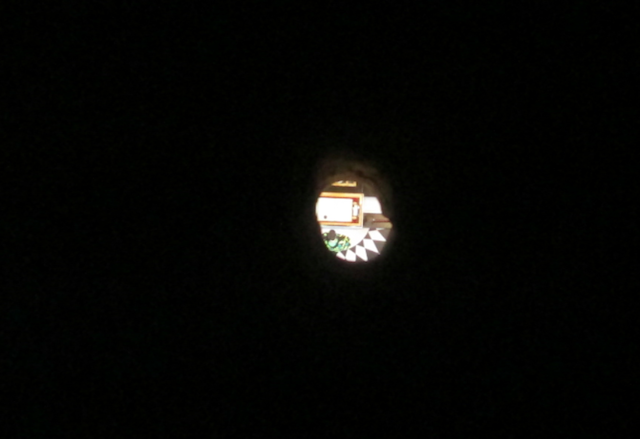 You can just make out a visitor looking through the book of remembrance for American war dead. Looking down on the central crossing beneath the dome. Heading into the clock room. 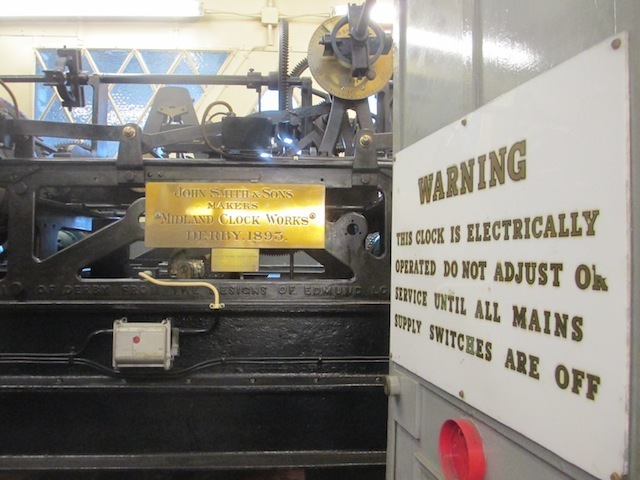 The machinery controls the three-sided clock in the south-west tower. Be warned...no foolish scribbling. 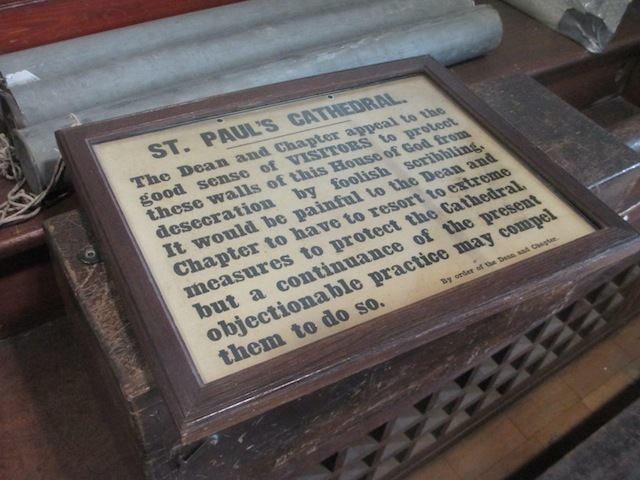 One of many signs, plans, maps and models dotted throughout the cathedrals' rooms. A geometric staircase. Apparently, it's unnamed, so we're dubbing it the Escher Stairs. 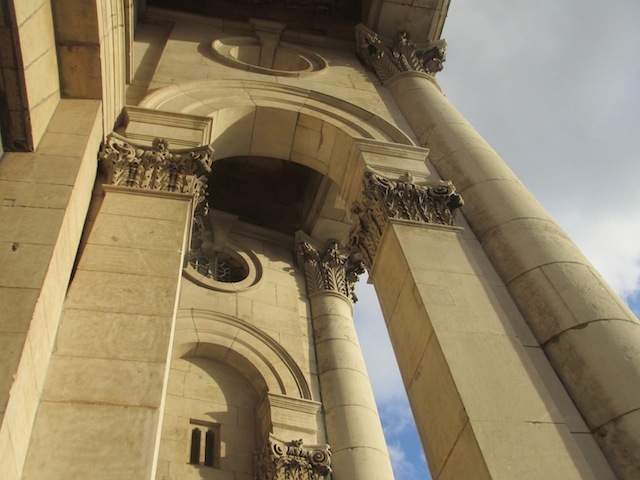 St Paul's Cathedral isn't just massive, it's also intricate. Beyond the public areas lurks a complex network of passages, rooms, stairs and voids that would (and did) keep Lara Croft happy for weeks. So labyrinthine is this building that even its chief surveyor admits there are rooms he's not yet visited. We were lucky enough to be given a private tour of some of these spaces. 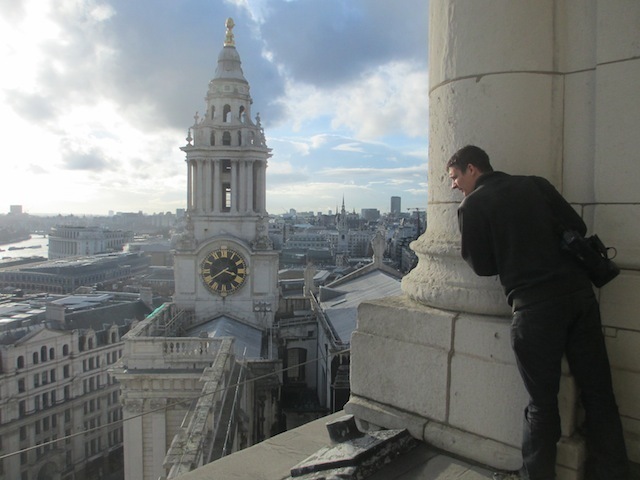 We clambered over the roof, onto the ledges, met the conservators, visited the bell chamber and — most oddly of all — passed through the 'Sick Room', which has always smelled of vomit and nobody knows why. 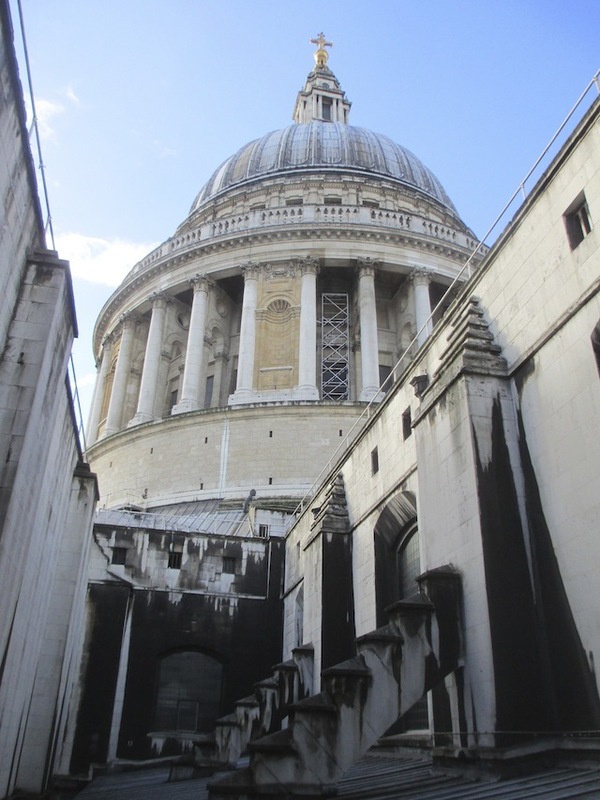 While most of the areas shown above are off-limits, the cathedral organises regular tours of some of the larger 'behind the scenes' spaces, including the library, 'Hogwarts' staircase and giant model of St Paul's. More info on those can be found here. The main parts of the Cathedral can, of course, be visited any time during normal opening hours, and it remains — first and foremost — a busy working church.